A week ago some of the people in my kayak club (Bay Area Sea Kayakers) chartered a boat for a trip to the Farallone Islands (Thanks to Maryly for organizing the trip!). We hoped to see the humpbacks and sharks. 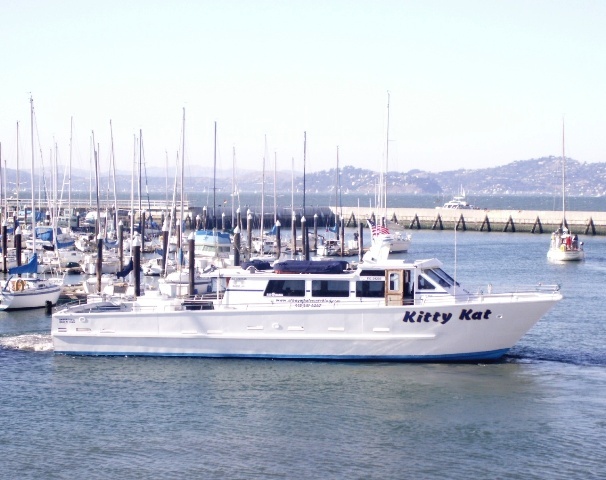 The Farallones have a large seal and seal lion population, so are also home to a large Great White Shark population that feeds off the seals and sea lions. 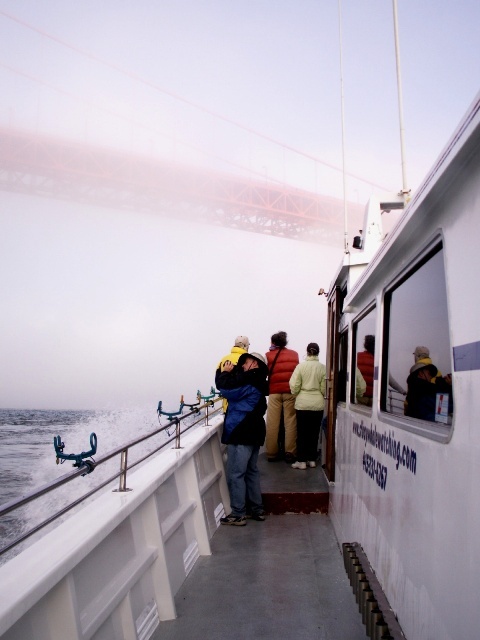 We headed out the Golden Gate in dense fog, heading directly west 30 miles to the Farallones. We continued in the fog past the lighthouse at Pt. 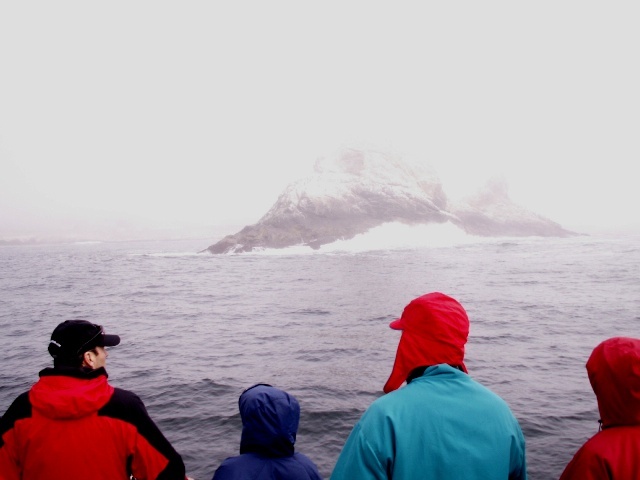 Bonita, a place most of the group has paddled to, and all the way to the Farallones, still enveloped in fog. There we found a few other boats, including a shark boat filled with divers taking turns going down in a shark cage, hoping to see sharks. We didn’t see sharks, but did see a few dolphins on the way out, as well as some seals (seal lions?) porpoising up and down out of the water. 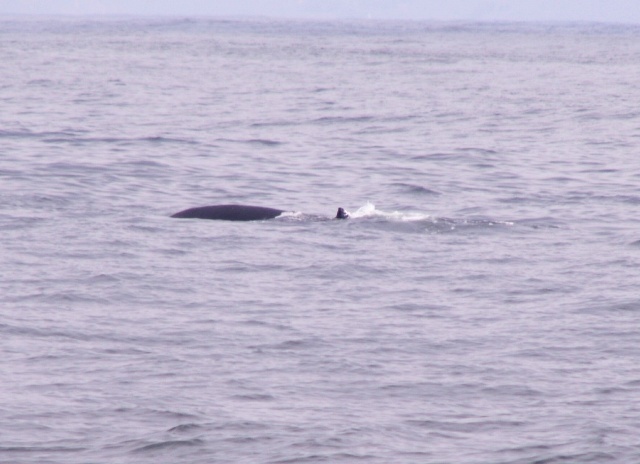 At about the time we needed to head home, we saw about a half-dozen whales. Mostly, they were lazing around the surface, perhaps feeding. They were usually submerged, but would come up for a few minutes of breathing and flipper slapping. When they submerged again, their humps would arch smoothly at the surface and they would glide under, with their large tail flukes coming up into the air then slowly slipping under the surface. There was an elegance and majesty to their movements. I hadn’t considered it previously, but their large bodies must move slowly most of the time. This slow, silent movement belies the great power these creatures have. 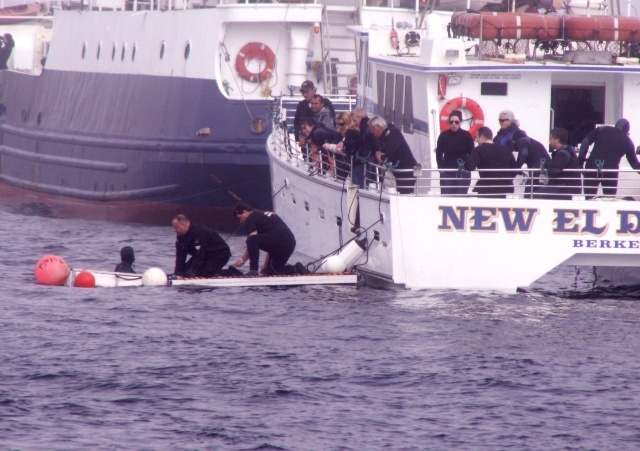 Our grand finale was when one of the whales breached, coming nearly completely out of the water. By now the fog had cleared and we headed home. 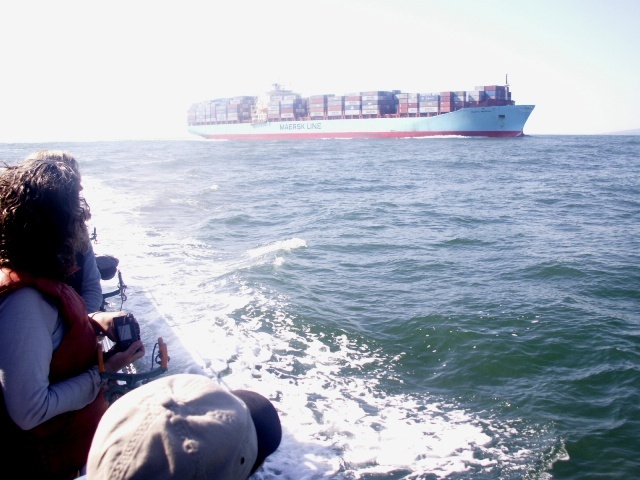 We noticed a pilot boat heading out and an hour or so later were overtaken by a freighter heading into San Francisco Bay on its way to the Oakland harbor. These ships are pretty amazing. Despite their size, they move at great speed across the ocean. 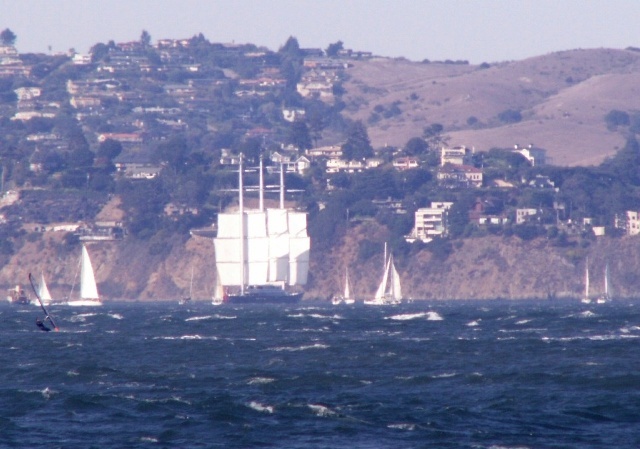 This was also the day the Maltese Falcon came into San Francisco Bay. It is the largest private sailing yacht in the world, but is fully automated and can be sailed (or so rumor has it) by just one person. That’s pretty amazing. Although we didn’t see its arrival, we did see it across the bay when we returned. We also saw a large number of kite-boarders and windsurfers out enjoying the brisk afternoon winds. All good things must come to an end, but in true BASK fashion, it wouldn’t be an outing without dinner. We split into smaller groups and headed on to various places. Before heading home, our group stopped for pizza at a nice place close to the marina. Sadly, although I used the larger of my two digital cameras, it wasn’t up to the task of getting good pictures at a distance, but I got a few. 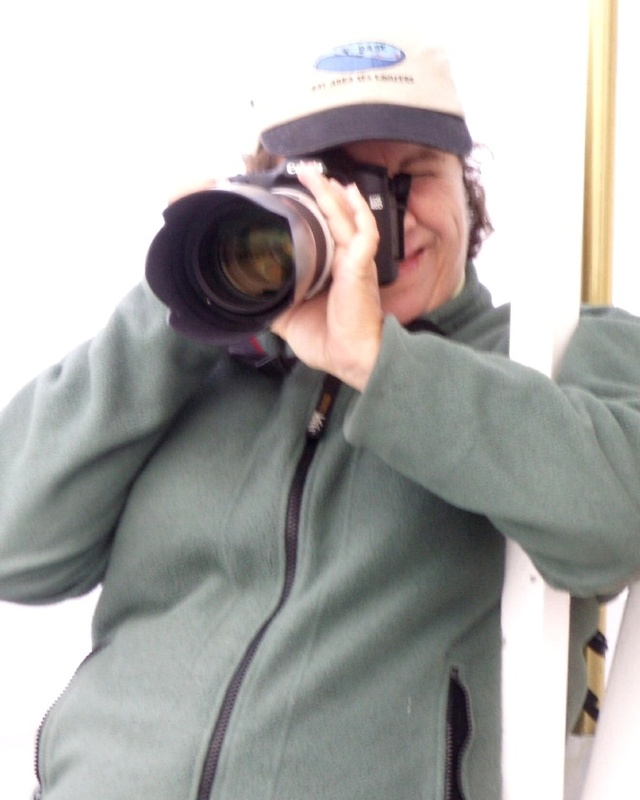 For some better pictures, see these pictures taken by Lisa with her monster lens and digital SLR. (Yes, that’s camera envy you’re hearing. Check the picture and you’ll see why.) Although none of the still-photographers caught the breaching whale, one person caught the breach on video, as well as another whale applauding with a little flipper smacking. Check out the video, complete with oohs and aahs from the human crowd.